You can garden standing up; sitting on a raised surround; or even in a wheelchair. What a capital idea! 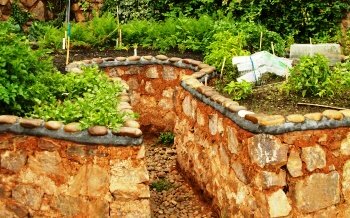 There are umpteen-thousand ways of raised bed gardening; it is a method that includes no-dig, no-till, lasagna, straw bale, layered and square foot gardening. A raised vegetable garden bed can be as high as a kite, as low as your toe and as many layers as you want to stack on. 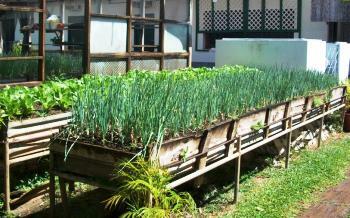 Raised vegetable gardens are loved by gardeners' backs, because there is less stooping and digging. So, phooey to all that seriously wicked waste of energy. Now let's get into the perennial argument over which raised bed gardening method is best. 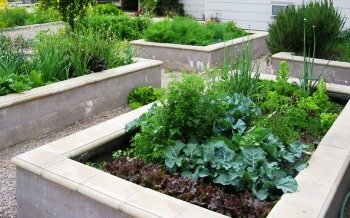 What constitutes a raised garden? 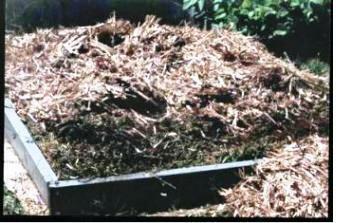 Anything such as a pile of dirt or a mound of no-dig materials (see Lasagna Gardening). But the real McCoy has borders built around it. Wood looks good. Scrounge or buy what you need. Kitsets are available, make your own or have a handyperson build them for you. There is some debate whether treated timber leaches preservatives into soil and plants, so avoid it if you're not 100% sure. Timber (or lumber) such as macrocarpa, totara, jarra, cedar and redwood will last for many years untreated... 7 years and some. 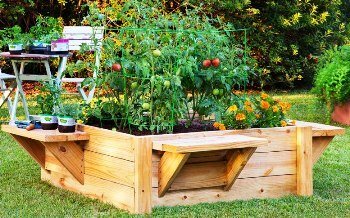 Some woods are softer and will breakdown quickly, but you can drench the insides of your garden boxes with safe and cheap linseed oil to help preserve them longer. Have you got access to bricks? Concrete blocks? Rocks? What about the beautiful edgings available from garden centers or old logs on beaches? And so on... the point being, is that there are hundreds of ways to make a raised vegetable garden, and there's no digging involved and they are built up from the ground, whether they are in boxes, tires, crates, or just natural mounds. 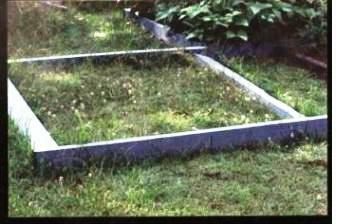 There are some interesting viewpoints and advice from readers here on cheap way to contain a raised garden bed. You can stop singing "My Achy, Achy Back Blues…" Make your raised bed gardens just the height you want to so it's comfortable to work alongside. 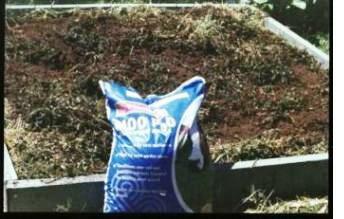 There's more area for the good 'ole sun to shine on, so your above ground garden boxes warm up faster. Four legged and two legged wanderers, such as dogs and children, are not so prone to skipping and leaping into your lettuces. 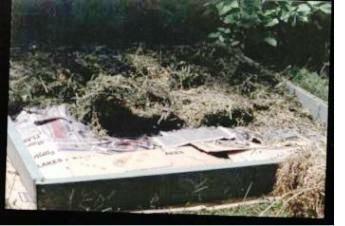 Plus, you can line the bottom of your beds with netting before you build to stop burrowing pests. You get to choose what goes into your garden boxes without having to remove anything first, such as rocks, sand, claggy clay, poisoned soil and so on. 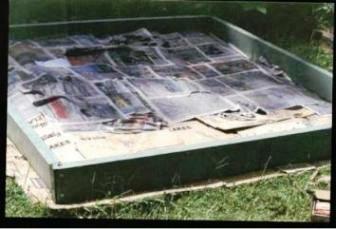 Fill up your raised beds with the best you can obtain for fast and healthy plant growing results. There are less worries with drainage and compaction, plus watering can be controlled in an enclosed area. 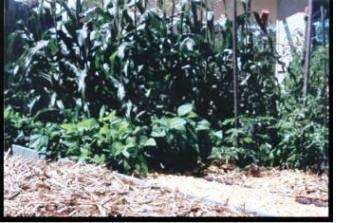 With raised bed gardening, everything is rather more tickety-boo than a common old ground hugging gaggle of stuff. Edges are defined, things stay in place, it's easy to reach over and pluck and pick, and it looks neat... both sorts of neat! Because the sides are exposed to the weather, watch out for your raised beds to dry out faster than the surrounding ground. Initial costs can be a bit stiff unless you use recycled materials. If for some reason you need to re-arrange your garden; botheration... it's a bother, no it's a big bother, to shift a raised bed garden. Step 1. Lay out your garden area. Let the grass die, or cut it if you wish. The garden beds can be any height. I've previously built ones for community groups of about 1m (3ft) high to allow for wheelchair access. It's a matter of layering to get things to the height you want. Step 3. 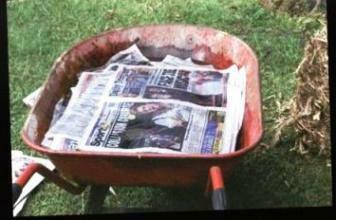 Wet your newspaper before you spread it out — it will stick together when you overlap it. Step 4. 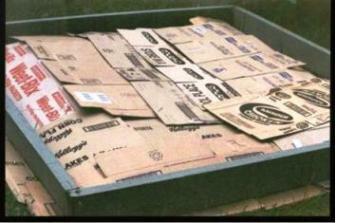 Spread WET newspaper OVER cardboard making sure that it overlaps by about a quarter to one third of its size. By cutting out the sunlight this way, the grass will die and along with the cardboard and paper, it will all rot back and feed Mother Earth. Step 5. Next comes a layer of Lucerne Hay (more food as it breaks down). Step 7. Finally this is all covered with a layer of straw (I use Pea Straw as it adds more nutrients as it breaks down) and it also works as a mulch for your plants keeping them warm in the winter and cool in the summer. Step 8. From here it is just a matter of making a small hole in the top layer of straw and adding a handful of potting mix or compost and planting into it. You can see the results of this one that I prepared earlier. I hope that this inspires you to build your own raised vegetable garden and to get out into your yard and smell the roses (or cabbages). 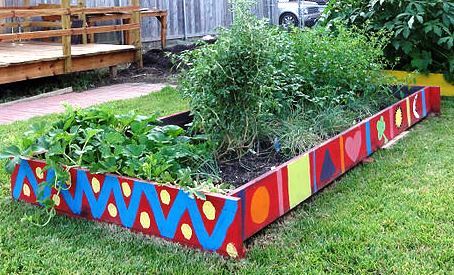 Ideas for building a raised bed vegetable garden.